An international team of collaborators is using PRACE high-performance computing resources to explain the intensity of star formation, a fundamental building block in understanding how galaxies are formed. Understanding the origins of our universe is the foundation to understanding its future. Researchers are using HPC to model the behavior of gases in galaxies to learn what is behind star bursts. They discovered an imbalance that generates an excess of dense gas and represents a milestone in understanding the link between star formation and galaxy evolution. Researchers led by Frederic Bournaud of France’s Institute of Research into the Fundamental Laws of the Universe are doing pioneering work in understanding star formation and its magnitude in colliding galaxies. Hydrodynamical simulation run with the RAMSES code at 1.5 parsec resolution. Old stars in red, gas in blue, newly formed stars in yellow and white. Courtesy Frederic Bournaud. Understanding of galaxy formation is severely limited by our lack of knowledge about star formation. We know that star formation is governed by the chaotic parsec-scale physics of the interstellar medium (ISM). Through observation, we know that when galaxies collide star bursts occur. But the link between the small-scale physics of star formation and galactic scales is still poorly understood. Bournaud and his colleagues believe that by modeling the behavior of gases in galaxies, we can learn what is behind the tremendous star bursts following the collision of galaxies. Galaxy formation, however, often proceeds in violent phases during which galaxies accrete mass very rapidly, collide and merge with each other – not just in calm isolation as in the case of work done in studying the Milky Way. The properties of ISM turbulence and ISM structures are likely different in such systems. Observationally, these systems often undergo strong ‘bursts’ of very rapid star formation. But it is still unknown whether these bursts are only a large-scale property with a universal efficiency of star formation on small scales, or if there could be locally-enhanced or locally-suppressed star formation in molecular clouds at some intermediate scale. The team began to explore the possibility that the conversion of low-density galaxy-wide gas reservoirs into molecular clouds and dense substructures may be a non-universal process. The researchers used numerical simulations of galaxies to study the properties of the ISM in various conditions. They did so based on the fact that the connection between the actual formation of individual stars on small scales, and the properties of star formation in molecular clouds and entire galaxies, is governed by the structure and properties of the ISM. Only recently simulations became capable of accurately describing the global structure and dynamics of galaxies and resolving supersonic turbulence in the cold phases of the ISM at the same time. Simulations of this type typically require very high resolution (around one parsec) in boxes of tens of kiloparsecs. Bournaud and his team utilized over 8 million core hours on the SuperMUC Tier-0 supercomputer at the Leibniz Supercomputing Centre (LRZ) in Garching, Germany to model ISM physics and star formation in such ‘extreme’ events with bursts of star formation. 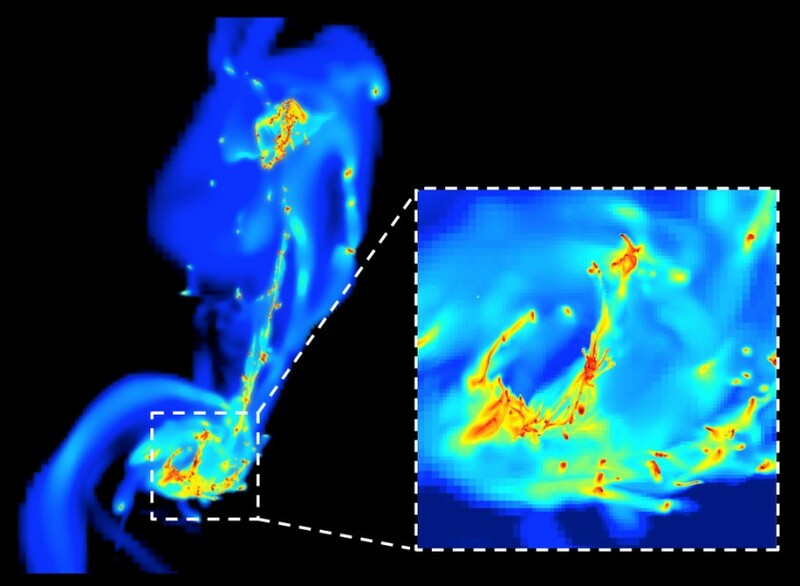 Using hydrodynamical simulations, the researchers proposed a physical explanation for the enhancement of star formation activity in galaxy mergers. They discovered that global SFR evolution reaches numerical convergence at parsec-scale resolution and that the rise of the gas mass fraction in compressive tides in extended volumes during the galactic collisions pumps turbulence into the ISM. This creates an imbalance in the equipartition between compressive and solenoidal turbulence modes and verifies that this turbulence is not primarily driven by feedback. The compressive turbulence overcomes the regulating, stabilizing effect of turbulence, and generates an excess of dense gas. This excess translates into enhanced star formation activity and drives the merger to the starburst regime in the Kennicutt- Schmidt diagram. From the gravitational and tidal trigger to the ignition of starburst, the full sequence takes ∼ 10 – 30 million years. These finding were based on a simulation of the Antennae galaxies. Obviously, in other interacting systems, the quantitative results we presented here are modulated by the parameters of the galaxies (shape of the halo, mass ratio, etc. ), and by the details of their interaction (spin-orbit coupling, impact parameter, orbital eccentricity, etc.). However, the ubiquity of compressive tides in mergers has been previously demonstrated, which suggests that the triggers and physical processes mentioned above exist in many mergers. While this work only accounted for integrated properties of the tides, turbulence, and star formation, a study of the spatial distribution in the galaxies as well as the propagation of these phenomena is currently ongoing. This work will aim to show that the locations in space and time of the compressive tides, compressive turbulence, and star-forming regions coincide. The results that Bournaud and his colleagues published in April 2014 represent a major milestone in understanding the link between star formation and galaxy evolution. In addition to probing the ‘normal’, isolated phases of star formation with the ongoing model of a Milky Way-type galaxy, this is a breakthrough toward the ability to probe ‘extreme’ modes where the ISM is highly perturbed by tidal interactions and large scale shocks. This process is best observed and modeled for nearby galaxies, but may be even more important to understand the early phases of galaxy formation in the distant universe. This research received the 2015 "La Recherche" Prize for Universe Sciences.